This favourite activity for beginners, social players, and weaker club players mostly wastes time, and the opponent's patience; and is certainly a bad habit. Of course there may well be a valid invasion. If not, you waste ko threats, and possibly points (by not reading properly, you can easily play gote moves). This is really the small-scale version of the mochikomi mistake. Valid invasions can often be played rather earlier than the small endgame plays. Naturally that isn't always the case, in that shortage of liberties and cutting points are created by plays right up to the end of the game. HolIgor: Despite many objections, I think that beginners must try everything to learn what could work and what could not. At the same time the opponents learn to defend. Eventually, some reading depth is developed as well as some notion of what are the weaknesses that needs to be protected. This helps a lot later when you play yose in more serious games. One of the most difficult problems is whether to spend one more move defending or go for points elsewhere. Sometimes even O Meien does not read that properly. Weaker players tend to add stones for safety allowing opponents to keep sente. I think that it is better to practice a little bit while you are inexperienced. Later it would be a shame. Pajaro: Maybe HolIgor is thinking abouth the 50th Oza Title (2002), against Cho Chikun. 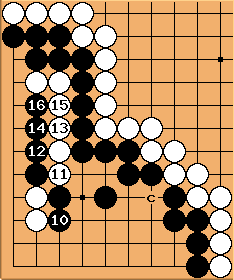 In the first game, Cho won because O, with a won game, didn't want to lose a point in yose to defend a defect. Cho used this to win the game. But in the second game, Cho was kind enough to have another won game and let it go by time. Gresil: What's the functional difference or relation between speculative invasion and Semedori? Why I'm asking it is that yesterday I lost a game by 0.5, and the last thing my opponent (20k) did was a really desperate-looking last-minute invasion attempt behind my 4th line wall - which may have set the result. 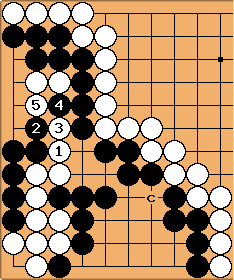 Charles Semedori is a high-level endgame technique, where giving up stones gains points (with best play on both sides). Speculative invasion is a downmarket attempt to see if your opponent will let you get away with something unreasonable. A speculative invasion can turn into semedori; but you are supposed to see this before you invade. nachtrabe: Something I've seen twice recently on KGS that certainly is very impolite at any level of play is when a player passes to enter the scoring phase (after a pass), sees that they are behind, and uses undo so that they can perform a deep speculative invasion. This is extremely annoying, far more so than the speculative invasion itself would have been if done before the scoring phase. aolen: This just happened to me on KGS - twice in the same game. It was especially unfortunate since it had been a very close game, which I had enjoyed immensely until he played out 10 minutes of pointless invasions. However, I managed to glean some humor out of the fact that I made a mistake which would have allowed him to win - but he didn't notice it! Bill: I have to agree with Holigor. Even when I was at the mid-kyu level, I would often make a invasion as a ko threat, only to find that it succeeded in its own right. If I had made more speculative invasions as a beginner, I would have been better at seeing those opportunities. Calvin: So, how strong to you have to get before this habit becomes significantly less frequent? If it tapers off, it might be a motivation for me to get stronger. uxs: I don't think this is a bad habit. If you never try anything, how can you know what works and what doesn't ? nachtrabe: There seems to be a distinct difference between the types of speculative invasions being discussed here. There is the "I need to live here/break this up if I want to have a chance" move and then there is the "it is the late endgame, I can't read out any way to live unless my opponent screws up, but I am going to invade anyway and hope for a mistake." (The alternative is "I am too lazy to read it out," which is no better). The former can be experimentation, it can even involve a brilliant move and is seen in games with certain pros. It can also fall under the category of "I move here, he moves there, and then things get really complicated"--if you are behind that can be a good thing. The latter--depending on an error to win late in the endgame--is another matter. QWerner: I think this is actually a middlegame problem. If someone has to invade late in the game to win and start some timewasting, ugly and boring invasions, than he didn't realise in the middlegame that he will lose the game (or he didn't count the territory). So he should have given up the game earlier. Basicly he missed the timing for invasion and reduction ect. in the middlegame. Bill: Actually, towards the end of the game, as the sides approach each other and dame get filled, opportunities to invade arise that were not there during the middle game. It is not uncommon for amateurs, particularly kyu players, to fail to protect against such invasions. Daryn? 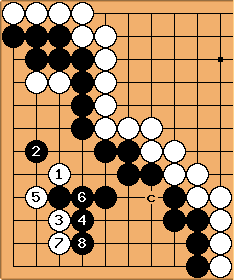 : This is an example from a game against GnuGo, which certainly never hesitates to turn my supposedly live groups into so many prisonners or into seki when I fail to add the crucial inside stone before filling in the last dame... Here we just exchanged 1 for 2, which are the last dame on the board. At this point I think his group has three weaknesses at a, b, and c.
Is an invasion attempt legitimate or impolite ? In a real game I would probably offer my opponent an undo if he wants to, and if he doesn't and fills the dame embark on the invasion. What do you think, and what would you do ? In this case I did not have the opportunity to offer the undo and just carried on. 2 was probably the worst initial refutation, and after 9 black is in dire straits... This is only one of the possible sequences, I certainly have not read them all. I wonder whether black can do better than 8. Successful? White is dead in my opinion. 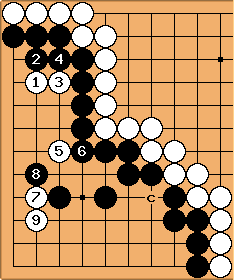 Tapir: Black may play better with and , but still White is dead, imho. The cut doesn't work. tapir: Playing at gives other interesting lines, but shouldn't work as well. Daryn? : It is tantalizingly close though... How about forcing one line below ? 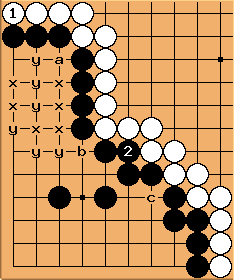 Here again GnuGo would let me live easily, for instance with the sequence shown. Is there a refutation ? tapir: If it isn't even close, than there really really is no invasion. And you shouldn't try. The idea of fighting is imo, to be just the crucial last liberty/last move ahead. To do this you shouldn't waste moves. In your example white got in sente and is alive after (Tripod group - with some complications). Playing at is but one way to omit this result and kill white ( at should be another one), you can than use to cut. Really try reading each and every time - and don't assume that a certain move (Why ?) will be necessarily played because it is an usual answer in somewhat resembling situations. Do you mind if we move this to Big Question Mark later?